History: "Flor Silvestre, La LLanera Vengadora, defended law and order in the northern Mexico town of "Las Cruces." 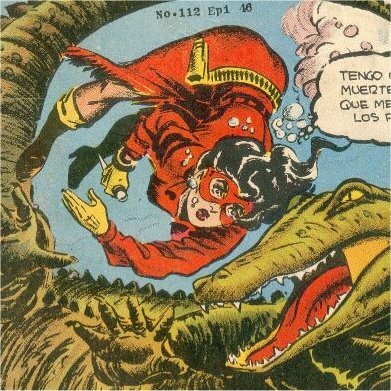 She used guns, a lasso, and rode a motorcycle, which she nicknamed "mi Carcochita." She lived with her younger brother, Fausto, who became her sidekick while she was in costume, although he may or may not have realised that he was helping his own sister in her fight for justice." Comments: Thanks to Fernando Franco Quiroz for the image at the top of the page. Thanks to Jean-Paul Tantte Rodriguez for providing information on and images of this character, and to Jon Glade of the International Comics Club for passing this information on. In addition to the above origin information, Jean-Paul also relayed the following through Jon:"She first appeared in her own comic sometime in the 1950s and the book lasted into the 60s. 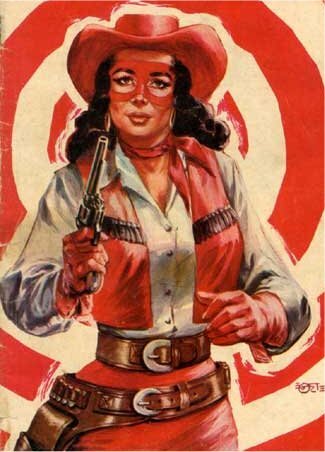 Llanera means "plainswoman," but the fact that the Lone Ranger was known in Mexico as "El Llanero Solitario" suggests that the word could be translated as "Ranger" or several other ways. Flor could be anything from "the Plainswoman Avenger" to "the Rangerette Avenger" to "the Frontier Avenger," although the last one seems the least likely. Her use of a motorcycle implies that she could have been a contemporary character, or at least operated during the twentieth century, instead of the nineteenth century. The fact that her younger brother becomes her sidekick but it is ambiguitous if he knows his sister is the Avengeress, implies that the secret identity aspect of the character was more important than with most characters, as does the fact that her "real" name appears on the cover. The use of a town called "Las Cruces" calls attention to a real border town (in New Mexico), although it could be that Flor's Las Cruces is meant to be fictional. It could be that "northern Mexico" could be the equivalent of the U.S.A.'s "wild west," since El Hombre Invisible sometimes operated in "northern Mexico". "